Inspired by furnishings by a top Italian designer, this contemporary Glass Dining Table boasts glamour and grace. Adding cosmopolitan charm to any dining room, it's crafted with acrylic and brass-finished stainless steel and paired with a sleek glass top. Dimensions 35.0 In. X 72.0 In. X 30.0 In. "What's the size an dementions of this tables leghth hight an width..?? 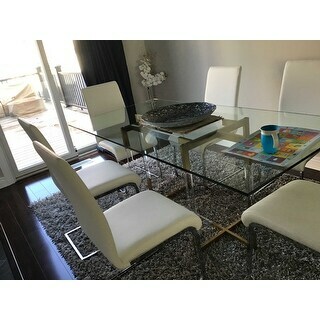 It doesn't say reason I guess bcz it out of stock as of now..Also when do u believe that this table will be back in stock.Hopefully before Christmas I hope .Can u please help me out with these questions..Thank u..Ms Tammy H."
"Does this gold / brass color match the metal in the Safavieh Modern Glam Moon Arc Cream/Gold Bench in the link below? https://www.overstock.com/Home-Garden/Safavieh-Modern-Glam-Moon-Arc-Cream-Gold-Bench/13453305/product.html?recset=74ed5544-5159-4d55-b8cc-eb4982340de7&refccid=RSEFMCA2MXL2USCFRZIPW2AXBA&recalg=914,873,839&recidx=0"
Yes, the two items will match. I hope it helps.